NPM or Node Package Manager is the same thing as APT to Debian. It is used to install, remove, update NodeJS packages. In this article, I will show you how to install and use NPM on Debian 9 Stretch. The version of NodeJS available in the official Debian 9 Stretch package repository is 4.x, which is very old. The official package repository of Debian 9 Stretch does not have NPM. In this section, I will install the latest stable version of NodeJS and NPM which is at the time of this writing 8.11.1. The NodeJS 8.x package repository should be added as you can see from the screenshot below. 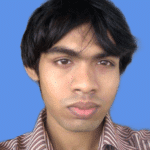 NodeJS, NPM and the required build tools for compiling NodeJS native modules are installed. As you can see, NodeJS 8.11.1 is installed and working correctly. As you can see NPM is installed correctly as well. 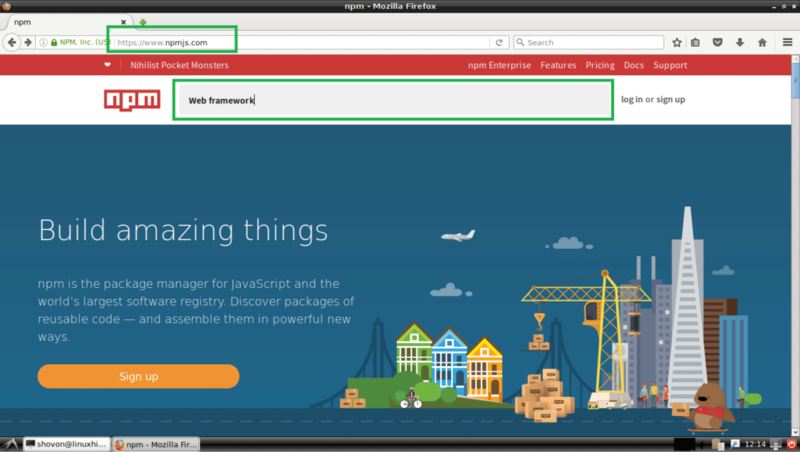 In this section, I will show you how to use NPM to manager NodeJS modules or packages. Before that, let’s talk about global packages and local packages. If you install a NodeJS package globally, then it should be saved somewhere /usr/lib/node_modules directory and you can access it from any NodeJS project. If you install a NodeJS package locally, then a directory node_modules/ should be created on your project directory and the package should be saved in node_modules/ directory relative to your project directory. It can only be accessed from that project. That’s all you need to know for now. Let’s continue. 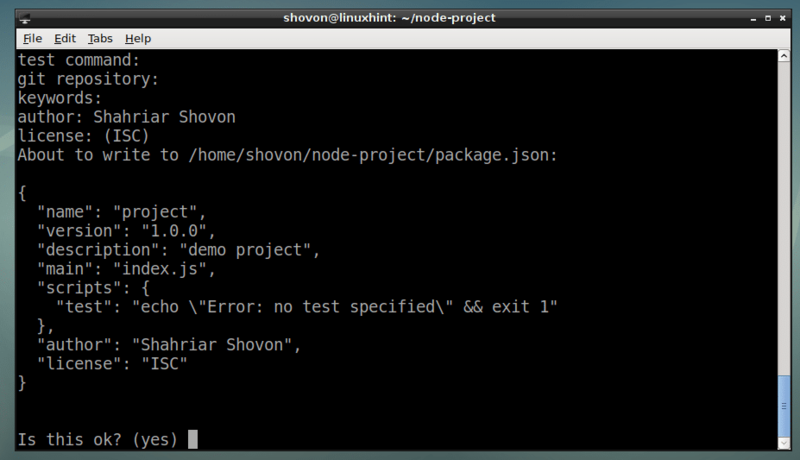 Every NodeJS project has a package.json file in its project’s root directory. This file holds information about your project, such as the name of the project, the version of the project, the dependencies or other NodeJS packages your project depends on and many more. You can manually create a package.json file and put all these information or you can use NPM to create it for you. Fill in the details and press <Enter> to move forward. In the end, type in yes and press <Enter>. As you can see, a package.json file is created. If you know the name of the package, then you can easily install it using NPM. express NodeJS package should be installed. It should be installed globally. The express NodeJS package is removed. Well, now you know how to install and remove NodeJS packages with NPM. Now the question is, how do I know what I can install with NPM? What packages are available? Well, you can search for packages in the NPM’s official website at https://www.npmjs.com/ or you can use NPM command line utility. 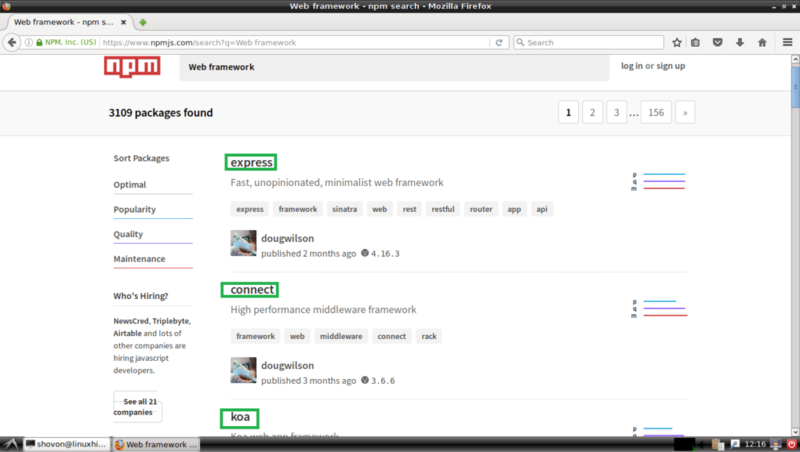 To search for NodeJS packages from your web browser, go to https://www.npmjs.com/ and search for what you’re looking for. Type in the keywords as marked in the screenshot below, and press <Enter>. You should see a lot of packages as you can see in the marked section of the screenshot below. You can click on any one of them to see more information about that package. 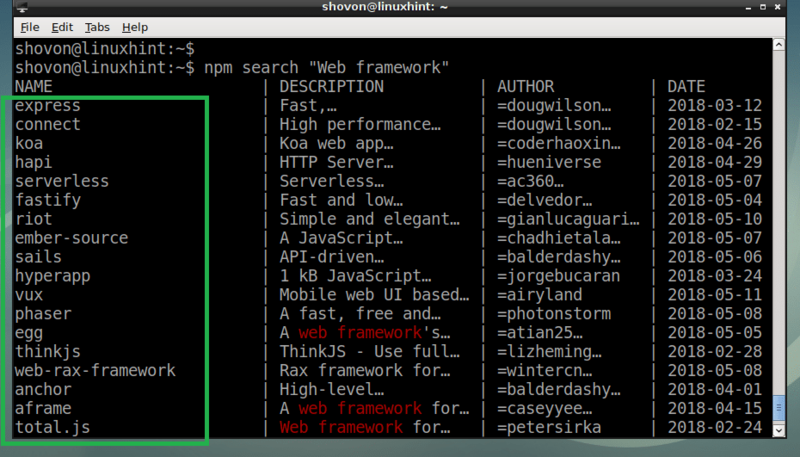 $ npm search "Web framework"
As you can see, the same list is displayed. You can pick up the package name from the first column as marked in the screenshot below, and install what you need using NPM. So that’s how you install and use NPM on Debian 9 Stretch. Thanks for reading this article.